Top Celebrity News | Top Celebrity Gossip | Top Entertainments: Hrithik, Katrina, Farhan and Abhay play Holi with tomatoes!! Hrithik, Katrina, Farhan and Abhay play Holi with tomatoes!! Hrithik Roshan and Katrina Kaif may not have celebrated Holi with colors this year, but the two definitely enjoyed the spirit of the festival, with a difference though. The two were in Spain shooting for Zoya Akhtar’s ‘Zindagi Mile Na Dobara’ and shot for an elaborate sequence based on the Tomatina Fesitval of Spain. The scene was filmed in a town in Valencia, Spain. Producer Ritesh Sidhwani reportedly ordered 16 tons of tomatoes from neighbouring Portugal for the sequence and Hrithik and Katrina, along with co-stars Farhan Akhtar and Abhay Deol hurled ripened tomatoes at each other. People from the town of Bunyol also took part in the shoot which took place on the actual time of the tomatina festival but since the shoot could not be completed in one day, this year Bunyol celebrated Tomatina for two days. 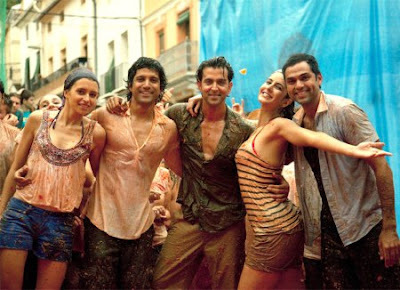 Check out the cast of ‘Zindagi Mile Na Dobara’ playing holi with tomatoes for the shoot of the film.